VANCOUVER, BC--(Marketwired - August 18, 2017) - Batero Gold Corp. ("Batero," the "Company") (TSX VENTURE: BAT) (FRANKFURT: 68B) (OTC PINK: BELDF) is pleased to report results from 51 holes drilled at the Company's 100% owned Batero-Quinchia project (the "Project"), located in Risaralda, Colombia. These 51 holes represent the conclusion of the Company's most recent infill drill program. 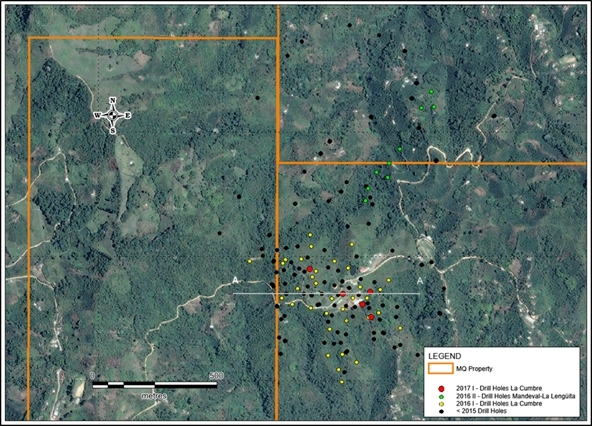 The sampling program completed 657 surface samples which confirms gold mineralization in La Cumbre and Mandeval, and delineates the La Lengüita mineralization along the San Luis creek. "We are pleased the results from our recent drill program continue to outline grades of over 1.0 g/t gold near surface," stated Gonzalo de Losada, Batero's President and Chief Executive Officer. "These positive drill results improve the confidence in the Batero-Quinchia deposit and further delineate the near surface oxide zone." Cross section N-585300 from La Cumbre (Figure 2) shows the depth of the near surface oxide and transition zone. *Interval length represents downhole length. Intervals are selected using a cut-off grade of 0.3 g/t and may include a maximum dilution of one sample interval under cut-off. Sample intervals are typically 2 metres. The Company, through its wholly-owned Colombian subsidiary Minera Quinchía S.A.S., has completed a community shared value program in alliance with the Canadian Government and the International Organization for Migration ("IOM") for the area of influence of Batero's exploration activities. The program, named "Improving Socio-Economic Development for Families in Quinchía, Risaralda" was submitted jointly by Batero and the IOM to the Department of Foreign Affairs, Trade and Development of the Government of Canada (formerly Canadian International Development Agency) during the 2012 call for proposals for the Strategic Partnerships for Development Fund ("SPDF") that was created as part of its Andean Regional Initiative. Roughly 5050 families in the area of influence benefitted from the program. "Batero has been committed to working with the community since the inception of the Company and the implementation of the program "Improving Socio-Economic Development for Families in Quinchía, Risaralda" is a testament to our ongoing commitment to local families", stated Gonzalo de Losada, President and CEO of Batero Gold Corp. The Company has commenced an environmental impact assessment ("EIA") with consultant Environmental and Geographical Services "SAG". Environmental and Geographical Services "SAG" has extensive experience preparing EIA studies within Colombia. The technical studies for the development of the EIA are expected to include hydrogeological and geotechnical model of the Batero-Quinchia deposit. Additionally, a socio-economic survey and characterization of all social and environmental components located in the area of direct and indirect influence of the Project is expected to be completed. The Company is also engaged in a Prior Consultation process which is part of the EIA. 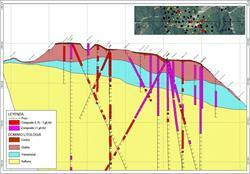 Core is collected, logged (geological & geotechnical), cut and sampled at Batero's drilling camp in the project area. All quality control ("QC") samples are introduced before shipment to ALS Minerals' sample preparation facilities in Medellin, Colombia. The prepared samples are then shipped to ALS Minerals' analytical facilities in Lima, Peru for analyses. Gold is fire-assayed using a 50 gram aliquot sample and Atomic Absorption finish. Multi- element analysis is achieved by Four Acid Digestion and an Induced Coupled Plasma-Emission Spectroscopy finish. The Company's QA/QC program includes the regular insertion of blanks, multiple certified assay standards and duplicate samples into the sample shipments. These QC samples are inserted in every assay batch with each batch comprising 12% of such samples. Monitoring of these QC samples is a critical part of Batero's QA/QC protocols that involve the re-analysis of a minimum of 10 samples bounding any failed control sample. A third party check laboratory receives 5% of all samples to verify the original assays. Roger Moss, Ph.D., P.Geo., a consultant at Batero, is the qualified person as defined by National Instrument 43-101 and has reviewed and approved the scientific and technical information provided in this news release. Batero Gold Corp. is a precious and base metals exploration and development company focused on two primary objectives. The first of these objectives is the advancement of the La Cumbre oxide deposit. La Cumbre is located within the Company's 100% owned Batero-Quinchia Gold Project, which sits within Colombia's emerging and prolific Mid Cauca gold and copper belt. 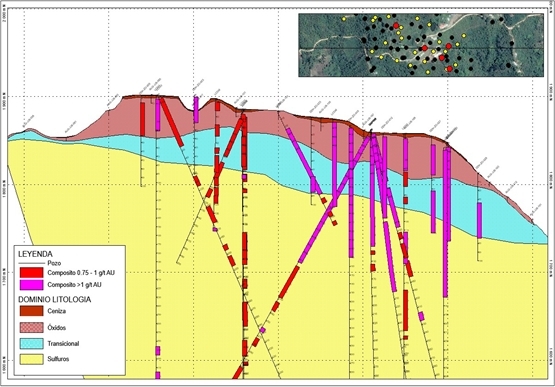 Batero intends to first target the near and at surface higher grade oxidized gold mineralization at the deposit. Batero's second objective is to pursue opportunities to acquire prospective high-grade, production-focused mineral properties in Colombia and Latin America. In pursuing both these objectives, Batero plans to leverage its secure treasury position, strong regional relationships, experienced management team, and long- term financial partners. Shares of the Vancouver-based company trade on the TSX-Venture Exchange under the symbol "BAT". Certain of the statements and information in this news release constitute "forward-looking statements" or "forward-looking information". Any statements or information that express or involve discussions with respect to predictions, expectations, beliefs, plans, projections, objectives, assumptions or future events or performance (often, but not always, using words or phrases such as "expects", "anticipates", "believes", "plans", "estimates", "intends", "targets", "goals", "forecasts", "objectives", "potential" or variations thereof or stating that certain actions, events or results "may", "could", "would", "might" or "will" be taken, occur or be achieved, or the negative of any of these terms and similar expressions) are not statements of historical fact and may be forward-looking statements or information. 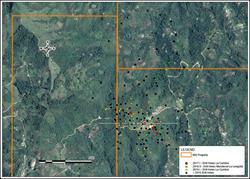 Forward-looking statements or information may relate to, among other things: grades on the Project; scope of mineralization within the Project; results of exploration activities; receipt and/or timing of required permits and regulatory approvals; the Company's objectives with respect to advancement of the Project and acquisition of prospective high-grade, production-focused mineral properties in Colombia and Latin America; scope and results of EIA; the sufficiency of the Company's capital to finance the Company's operations; and geological interpretations and potential mineral recovery processes. The Company's actual results could differ materially from those anticipated in forward-looking statements and information. Forward-looking statements and information are subject to a variety of known and unknown risks, uncertainties and other factors that could cause actual events or results to differ from those reflected in the forward-looking statements or information, including, but not limited to, the following: uncertainty of whether there will ever be development or production at the Company's mineral exploration properties; geological, technical, drilling or processing problems; liabilities and risks, including environmental liabilities and risks, inherent in mineral exploration and development; fluctuations in currency exchange and interest rates; incorrect assessments of the value of acquisitions; unanticipated results of exploration activities; competition for, among other things, capital, undeveloped lands and skilled personnel; lack of availability of additional financing and/or joint venture partners; unpredictable weather conditions, as well as those other risk factors described under the heading "Financial Instruments and Other Risk Exposures" set forth in the Company's management's discussion and analysis. The Company's forward-looking statements and information are based on the assumptions, beliefs, expectations and opinions of management as of the date of this news release, including, but not limited to, that the results of planned exploration activities are as anticipated, the price of metals, the anticipated cost of planned exploration activities, that general business and economic conditions will not change in a material adverse manner, that financing will be available if and when needed and on reasonable terms, and that third party contractors, equipment and supplies and governmental and other approvals required to conduct the Company's planned exploration activities will be available on reasonable terms and in a timely manner. Other than as required by applicable securities laws, the Company does not assume any obligation to update forward-looking statements or information in the event that circumstances or management's assumptions, beliefs, expectations or opinions should change, or there should occur or develop changes in any other events affecting such statements or information. For the reasons set forth above, investors should not place undue reliance on forward-looking statements and information.